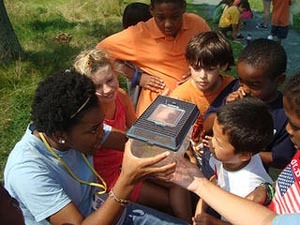 Boston Nature Center (BNC) summer camp is an all-inclusive, full day program accredited by the Office of Child Care Services and the Massachusetts Department of Public Health. Summer Camp takes place outdoors on 67 acres of land in Mattapan, which consists of trails, meadows, forests, wetlands, and gardens, and indoors in the classrooms at the George Robert White Environmental Conservation Center. BNC camp has organized ten themed weeks of hands-on, fun-filled adventures. Campers are encouraged to connect their BNC experience with their own lives. Operated on 67 acres in Mattapann by Mass Audubon, this camp has weekly themes for children ages 5 - 14. It's nature by way of explorations, gardening and games in a noncompetitive atmosphere.